Hello there, MikuDB! My name’s Xen0va, and as you may have gathered, I’m new here. Forgive me, but I’d like to start by delving into the real world a bit. My apologies to RenegadeMizu, to whom these next two paragraphs will look awfully familiar. I’ve been a Vocaloid fan on and off for around five years, but rediscovered the genre in 2014 with a more serious interest. Since then, I’ve looked at the social and psychological implications, such as rationalising why Miku wouldn’t find as great a success in the West as Japan, as well as working on a research paper regarding the more technical elements of the software. In the past, I have found enjoyment in trying to find deeper and implied meanings in songs, and I take great interest in the history and development of the genre and the names pivotal to Miku’s found influence. Aside from that, I’m a student of Maths, Computer Science and Physics in the United Kingdom, with an interest in the creative arts that isn’t satisfied by my academia. For a while, I was considering starting a blog, on which I would talk about Vocaloid, Speedrunning (the act of playing video games with the intention of beating them as fast as possible), and other related topics. However, despite my enjoyment for writing, I was hesitant at the thought of releasing work into the public domain without an audience, so the idea died. But now, here I am. What I’m inadvertently doing is creating a first impression. As you read, you’ll be generating a mental image of me in your head, along with connotations and associations you can use to make assumptions about me and my behaviour. Sociologists and psychologists will both tell you that first impressions are vital, and the media will tell you that “A first impression takes three times as long to overwrite as it does to write”. I can neither prove nor disprove that, but it is true that starting off on the right foot is vital. Get the wrong first impression, and you could hate that show, person, whatever it may be, forever. The biggest stumbling block that people come across when considering Vocaloid for the first time is the concept. That is, a computer singing and being considered as a real person; or, at the very least, comparable to one. (Almost) everybody I’ve introduced Vocaloid to has thought the same thing – the technology is incredible, but the concept “slightly creepy”. And yes, the West will always find it harder to “accept” Miku & Co. than Japan (reasons for which I shall explore in a later article). And of course, the aesthetics follow in a similar vein. 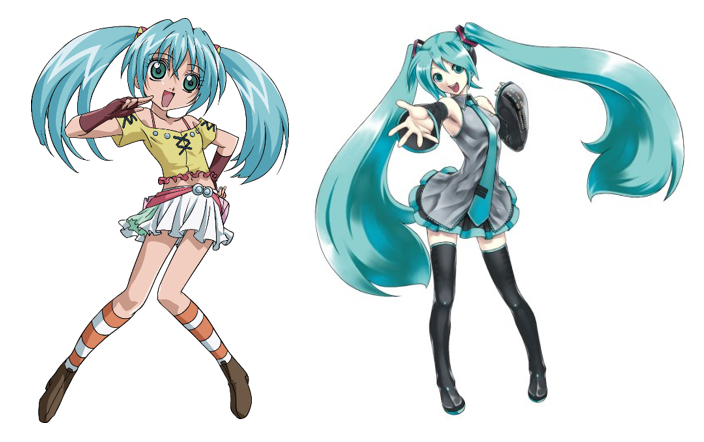 Despite being anime-styled, you’d find it hard to misidentify Miku. The closest case is Runo Misaki from Bakugan, and even that’s pushing it. That recognisability, the face you can’t forget: it’s the perfect opportunity for one of the other major elements of the Character Vocal Series to come into play – modules. 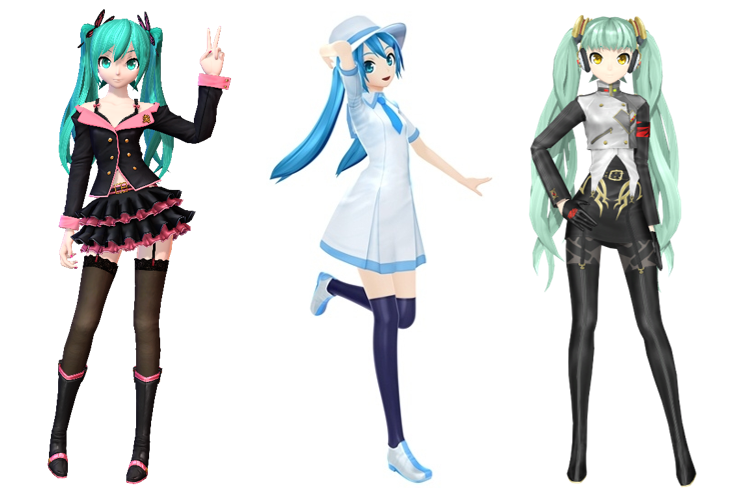 More broadly, other Vocaloids can feature their own clothing in individual PVs, but it’s not to the same extent as the “dress up doll” that can be made of Miku and her friends. Hundreds of outfits, all perfectly fitting to song styles and themes; all the while reinforcing the idea of the openness of Vocaloid. They can be anyone; and it’s hard to confuse the manipulative Honey Whip with the nostalgic Summer Memories or the despondent Agitation – but they’re all the same software. This openness and variety – a deliberate touch on the part of Crypton Future Media (more so than other developers) – partially explains their huge success. It all comes together to create a totally immersive and unique style of music. You ask someone “What was your first experience with Vocaloid?” and there is no pre-determined answer. In fact, most people might not even realised they’ve been exposed to it. Ievan Polkka was recently the backing track for a UK advert on national TV featuring LG smartphones. There is something out there for everyone to have a great first impression of Vocaloid. But as is the way with most things Japan, you just need not to alienate them first. I’m glad I wasn’t the only person to see the LG advert with the Ievan Polkka, and I agree that many people had absolutely no idea who sang it, like you said.